I know you are wondering whether it is really Paneer butter masala. Yah its true ... just for a change, instead of putting cubed paneer I made this way ...It looks good too right ???. Paneer Butter Masala is an excellent side dish for naan, pulao, Roti and many. Tomato - 4 to 5 medium (blanch in hot water, remove skin and puree it you should yield approximately 2 cups of puree) You can also use Canned tomato Sauce/Puree. Cashew - 3 (Soak in hot water and make a paste along with Tomato). Cream, coriander and green chilli for garnishing. Mix everything together and keep it aside. 1. Heat tbsp of oil and 2 tbsp of butter in frying pan. Add the tempering ingredients. 2. Add the ginger garlic paste and Green chilli, Saute until raw aroma disappears. Now add all the powders. Then add tbsp of water to avoid burning. 3. Then add onion and tomato puree. 4. Let it cook until moisture is absorbed and oil separates. 5. Now add tbsp of water and loosen the mixture. Now add the milk or cream and whisk constantl. 6. Now add the tomato ketchup and honey. Add the paneer cubes let it boil for few seconds. Add water if necessary to adjust the consistency. Now add the crushed kasoori methi. 7. Garnish with fresh cream,coriander and julienne green chilli. Serve hot with naan, rice or roti. 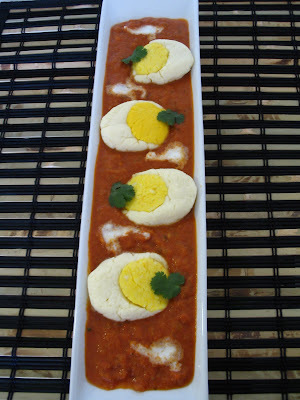 1.For making the egg shape paneer as shown in the picture. Mash the paneer, to one part add the yellow food color. Make oval shape ball in white paneer and make small yellow ball with yellow mixed one. Make hollow in oval shaped ball and put yellow and flatten it. Put these in the gravy when it is hot and let it cook for few seconds. 2. When making gray you can also cook the tomato, onion and cashew in butter and puree it to get the deep red color. 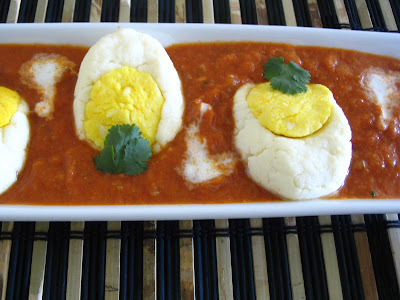 nice ideas you have...they are looking like eggs..lovely presentation pavitra..masala looks so creamy n yummy!! Wow , Great idea! Great presentation. Gorgeous pictures. Masala is delicious.... Good job Pavitra. you are so very creative I am so happy our paths have crossed.....this dish looks great and it definitely takes the simple paneer in to a whole new zone! wow you had wonderful creativity..nobody can think like you..
lovely decoration and the recipe plz pass me some naans for sure :). very delicious. wow..i seriously mistook the pic for egg.its so nice that u thot out of the box .way to go. i'm always stuck with the pix whenever i visit u! Lovely decoration anni... Even i thought u had placed eggs. Very professional!!! Looks attractive! Nice idea! Delicious recipe..
Looks very attractive. Nice presentation. 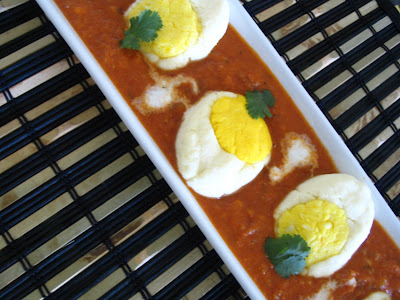 oops u made paneer look like egg.. thats super idea. i was sort of wondering as to why you added egg to paneer? Your food styling is just amazing... Im a total fan of your photography.. man I wish I could be so organized as wll as so effiecient in doing it all! wow..so creative...lovely presentation..after seeing the pic i thought you published different pic by mistake ...God, you 're genius girl!